Nothing screams summer more than a pretty palm leaf print that's incorporated into your outfit, right? I don't know whether it's the fact that it's totally in style right now or that it is finally starting to warm up outside, but I am so into this palm print lately. It's so classic and cute, yet different from anything I own. It almost has a sort of fun 80's vibe to it. Either way, pairing this green print with navy and white stripes is always a perfect match, as well as with pink or simply white. So far I've purchased this bikini top (in. love. ), but I can't wait to add more of it to my wardrobe. I'm thinking those shorts have to be next! What are your thoughts on this leaf trend? Love that palm leaf bathing suit! 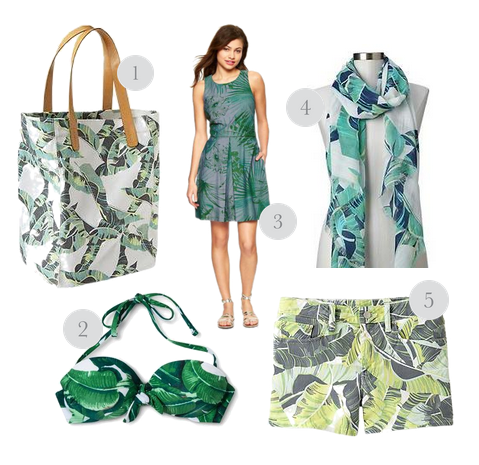 I love the palm leaf print -- it's so ideal for summer!